When I was in high school I had a Gibson Johnny Smith model guitar, it was about the top of their line and in 1963 when I got it there were only a few guitars that cost more. Don't ask how I got it, its too long a story, suffice it to say my father respected my taste in instruments. The Johnny Smith Guitar sold for about one-third of what a Chevy Impala cost at the time. 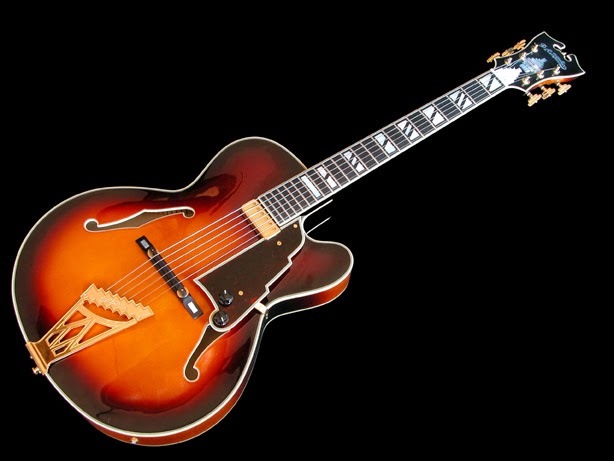 When I started looking to buy a jazz guitar about 10 years ago, I learned that the Johnny Smith guitar was actually a copy, or knockoff, of a guitar built by John D'angelico in the 1940's. He and his apprentices built about 1200 guitars of various designs. 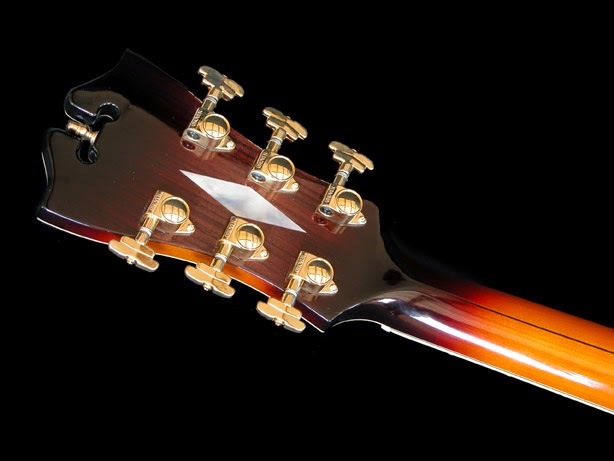 Often the guitars were custom made for specific guitar players. Johnny Smith actually had one of these. 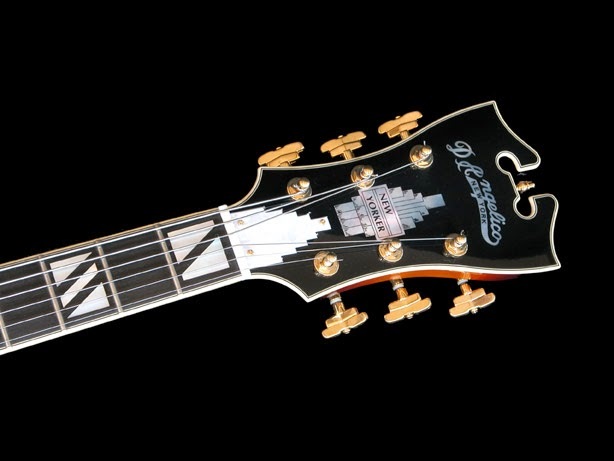 In the 90's, I think, the D'Angelico brand and design was bought by a company and the manufacture of the guitars was moved to Japan. A company called Vestax was commissioned to build them. I bought this one used about ten years ago on ebay. It is the pride of my guitars, one of the best playing and sounding guitars I have. The metal is thick gold and the fingerboard is ebony with large split block inlays. They still make guitars guitars of this quality but not many and not cheap. This one is an NYS-2 in vintage sunburst. It is a small guitar, a 14" body. This is actually inspired by John D'Angelico because he never made a 14" guitar. It has a single "Johnny Smith" style humbucker attached to the neck, not the body. The pegboard inlays are intricate and beautiful. There is even an inlay of pearl on the back of the pegboard. 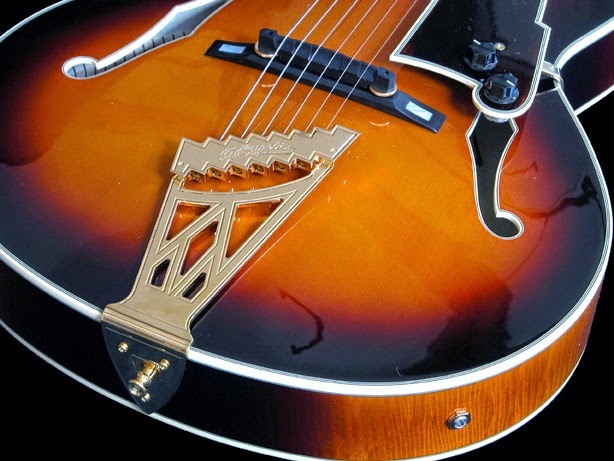 The classic stairstep design is featured in the tailpiece, truss rod cover and pickguard. The guitar has worn particularly well, it has a beautiful finish, slim neck and a great sound.